If you love yourself some Carpool Karaoke, Air New Zealand's hoping you'll be willing to watch celebrities hit new decibel levels in an airplane cockpit. The below video is a public pitch aimed straight for late-night talk show host James Corden, who has created viral hit after viral hit with the popular segment, featuring musicians and other stars singing along with him to popular tracks while driving around Los Angeles. Corden notably even convinced Michelle Obama to jam to Beyoncé last month). 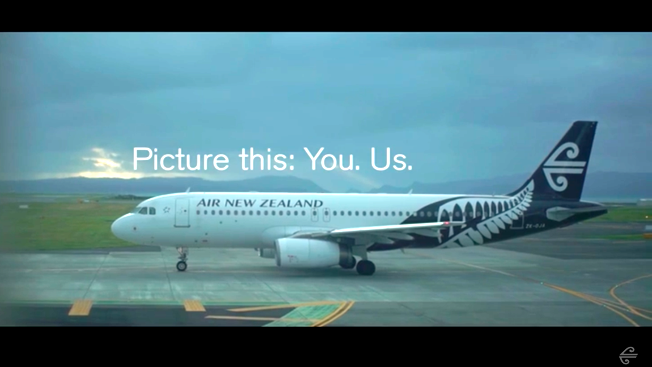 "Mate, we've got a pitch for you," the Air New Zealand video begins. "Picture this: You. Us." The airline promises Corden epic hashtag-worthy views and laughs aplenty in a concept they've catchily dubbed #CockpitKaraoke. On the off-chance that Corden's into it, Air New Zealand supplicates him to get in touch: "Tweet. DM. Snapchat. Message in a bottle. (Such a lost art.)" The video's less fun than the brand's Middle Earth-themed safety videos, but it does underscore a willingness to transcend its long-running Lord of the Rings schtick in exchange for a more recent pop culture phenomenon. Plus, it's in keeping with the quirky playfulness we've come to associate with them. This is also not a bad time to hit Carpool Karaoke up while the property—born as a Late Late Show segment—is still hot: CBS is looking for ways to monetize it, and in June, the show partnered with McDonald's and Coca-Cola for its first-ever Carpool Karaoke integration. Following news that Spike is planning its own competitive carpool singing show, just as packed with sparkly stars, CBS has spun Carpool Karaoke into a series of its own, available on Apple Music. We hope Corden and CBS take the offer seriously, if only so we can get answers to a few burning questions: Will Corden fly the plane alongside his singing celebs, as he once drove the streets? Will Gandalf make a musical cameo? Would air traffic control be willing to jump in for the funky chorus bits? But if that isn't convincing enough, here's a real reason to greenlight the concept: There's no better way to own the competition than to take the concept from roadside to birdside. How could Spike beat that?